This post is part 7 of our 8 part series on increasing Client Engagement from our Client Relationship Performance in the New Behavioral Economy White Paper. The insights will demonstrate in practical terms how to apply predictive behavioral insights to tailor client communication and provide unique client experiences. Earlier in this series, Chris mentioned that now that Frank Butler had become a client, he wanted the Coddington client service team to start interacting with him. So Chris asked us for the scripts of how each team member should communicate with Frank. Chris also mentioned that he had recently taken on Craig Moon as a client, and Craig had a Stability Need communication style. Craig would be served by the same team as Frank Butler. So, Chris could see that it was imperative that his team keep focused on the differences. (Click here to read the previous posts in this series). It was encouraging that Chris could now see the benefit of adopting a behavioral approach to client engagement. We said that the first step to rolling this methodology out across the client base was for each team member to be aware of his or her own natural DNA communication style. Otherwise, how would the team member know how to adapt to each client? So you can see below the scripts for how Chris and each of his team members would communicate with Frank Butler and Craig Moon. What you can see from these scripts is that because Chris is also a Goal Setter, he should have no problem serving Frank. There will be instant connection and respect. However, the biggest adapting challenge will be for Sarah, who has a Stability Need. Sarah will need to toughen up and learn to be more direct when dealing with Frank and accept that he may be cold at times. The relationship would be helped if Frank knows to be calmer with Sarah and respect that she will be providing him with a very reliable service. Dealing with Craig Moon is the opposite. Chris will have to substantially adapt his communication style to serve Craig successfully over a long period. The challenge for Chris will be when Craig calls up at a pressured moment for Chris. Chris may unconsciously not give Craig enough time and warmth. After a while Craig will think Chris is not approachable, and the risk is that when an intimate discussion is needed, Craig will go elsewhere. The saving grace can be Sarah, who must be regularly interfaced with Craig at the front end of any interaction as she can provide the warmth needed. This is more food for thought that Chris needs to consider in managing his client service approach. Chris is now seeing that his whole business is being driven by behavior. What are your thoughts? For additional information on increasing engagement of others, visit our Communication DNA Website. To Learn More, read the full Client Relationship Performance in the New Behavioral Economy White Paper. I recently read an article, The Success Formula, that talked about the future direction of businesses.? Heres an interesting trend: hiring people not because they fit in a box-like job description, but because they have the skills and talents that matches the companys mission and vision. What this says to me is that the how or mechanics (left brain) of business has now become a given?the starting point or the entry ticket. You are expected to have a certain amount of product knowledge and understand the ten steps to create more business. What will separate you from others and drive your performance, results, and sales is your behavior (right brain). according to Gallup Research, is that over time you will see a 240% increase in profits when both employees and clients are fully engaged! Left Brain:? Be sure to focus on the exact client you want to attract.? Include assets, career type, age, etc. Add Right Brain: Be sure you know the inner world of the client you want to attract. Are they fun, outgoing, and practical like you?? If they are, it will be much easier for you and you will be more energized throughout your day. Just because they have $2 million to invest doesnt make them an A client.? Its more than just numbers. If you have more than one type of client, maybe you want to limit the number of clients in each type. Left Brain: Have a plan for encouraging referrals.? Be sure to ask for them on a consistent basis.? Establish strategic relationships.? Communicate (conference call, newsletter, webinar) on a monthly basis using a focused approach. Add Right Brain: How you ask for a referral depends on both the type of person you are and the type of person you are asking. If your client is naturally more trusting, they may automatically give you a referral with just a gentle reminder that you are adding to your client base. How you ask for a referral will depend on your type of personality as well as your client.? How do you adjust your tone of voice, the words you say, etc. to the type of client? Focused communication requires personalizing the experience for a client.? A newsletter with lots of market details will not be suited for every type of client.? Graphics with short bullet points would be better in many cases. Step #3:? Hiring the right staff is critical for success. Left Brain:? Hire when growth is projected rather than when it occurs.? Determine how much time an advisor spends with each client to analyze your staffing needs.? It takes 18 months for an advisor to become productive. Add Right Brain: How do you define the right staff? Think about adding a type of person that is a complimentary style to your own to attract different types of clients. Or, a style that can tag-team with you in client meetings.? You will each hear different things and be able to give the client a better perspective. Behavior can block performance.? Hire a person with a style that fits the job and your team. Step #4:? Make sure your technology is up to date. Left Brain: Review your three-year technology plan for disk space, bandwidth.? Do you need a new laptop, an iPad, an iPhone? How about software needs? 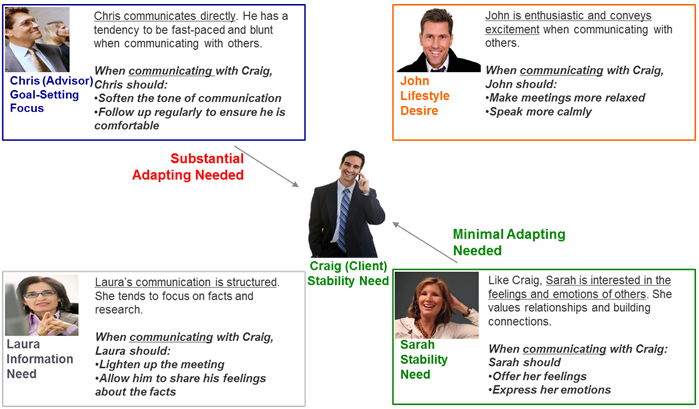 Add Right Brain: Add communication styles into your CRM. Every phone call, every meeting, every communication is tailored to create a unique experience for each client. Engage your clients and staff in exactly the way they need to create lifetime relationships. How do you get started with a whole brain business approach? 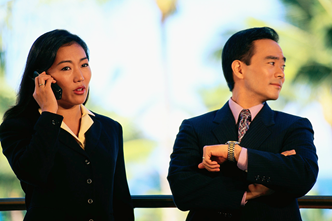 Take two minutes and check out your communication style, click here. This post is part 6 of our 8 part series on increasing Client Engagement from our Client Relationship Performance in the New Behavioral Economy White Paper. The insights will demonstrate in practical terms how to apply predictive behavioral insights to tailor client communication and provide unique client experiences. Earlier in this series, we learned about Chris Coddington and his meetings with a client named Frank Butler. Chris was given information about the 4 Communication DNA Styles, processes for discovering which communication style a client has and specific communication keys for each communication style. (Click here to read the previous posts in this series). Chris mentioned that he had invited 20 clients with similar levels of wealth and age to his office for a lunch and learn presentation by Paul Southwick on a new investment strategy. The new strategy will provide a mix of dividends and capital growth with some downside protection. Chris has vetted the investment and believes it will fit his clients well. Paul uses a PowerPoint presentation with great content in it about the bottom line of the investment and is an articulate presenter. As he goes through the presentation there are clearly some who get it and want to sign up, there are others who are totally confused by the details and switched off, others who want to do more research and some who need to understand how it meets their security needs. After the lunch Chris is very concerned about the mixed reaction and losing client trust. He knows the product is sound, and he will invest personally. Have you ever attended a presentation like the one Chris arranged and been de-energized, bamboozled and confused by the investment proposal and not responded? Understanding investors learning styles and propensities for receiving information, new ideas, strategies, products and solutions is critical to successfully presenting to them. This will increase the chance that they understand the proposal for what it is and how it is relevant to them. The mistake many advisors and fund managers make is that they naturally present to investors through their own lens. Instead, they should be re-framing how they present to be much more on the investors unique terms. The difference between what the advisor said and what the client heard will be attributable to the behavioral lens of each. The communication of products and solutions must be adapted based on different learning styles. Advisors need to appreciate that with 20 people in the room there could be 20 different reactions, because each person is unique. An important new area of behavioral research relating to communication is a persons learning style, i.e., whether a person is more Anchored (experiential) or Creative (new idea driven), or whether the person is more left-brained (logic and reasoning) or right-brained (stories and feelings). This difference in behavior (not intellect) has a very significant impact on how people should be presented to. For Goal-Setting Focus clients ? provide the big picture and how it relates to achieving goals and bottom-line returns. Allow for discussions for them to absorb the information. For Lifestyle Desire clients ? indicate how their lifestyle needs will be met along with telling them the names of the people involved in managing the product or solution. Provide them with minimal detail, because they will be guided by their intuition and will make an instinctive choice. For Stability Need clients ? address their financial security and allow them to sense the opportunity by providing feelings and emotions. For Information Need clients ? provide the history and research details, and make the solution tangible. This post is part 5 of our 8 part series on increasing Client Engagement from our Client Relationship Performance in the New Behavioral Economy White Paper. The insights will demonstrate in practical terms how to apply predictive behavioral insights to tailor client communication and provide unique client experiences. Earlier in this series, we learned about Chris Coddington and his meetings with a client named Frank Butler. 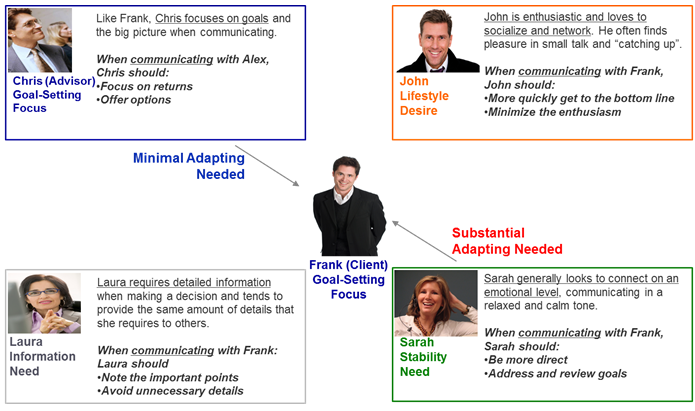 Chris was given information about the 4 Communication DNA Styles, processes for discovering which communication style a client has and guidelines for matching clients to the right advisor based on communication style. (Click here to read the previous posts in this series). We told Chris that a future trend will be advisors building client service teams that are a custom fit for the client. This provides the advisor with the opportunity to include team members with different styles to complement the advisors behavior. Imagine when a telephone call comes in and the team automatically knows who is to pick it up, then how to communicate with the client, and how to manage the work flow and even product or solution offerings. This really is the Ideal Advisory Business. Chris could also see that this strategy would be good for succession planning. Chris then said, I want some specific communication keys that I can put into my online contact management system so that whenever a client calls up or I am preparing for a meeting, I will know how to adapt my communication. Also, these communication keys need to be memorable so that the client gets engaged with them. Further, and very importantly, I also want this sustainable and scalable across my client service team. The way we have structured our business is that the one family client is served by different people on the team depending on whether the needs are financial planning, investments or administration. Each person does have a very unique way in which he or she likes to be communicated with. This was clear from what Frank Butler said in his first meeting about wanting options and recommendations so that he could make a decision. What this message really said to Chris is that trust in the relationship will not be developed unless Chris and his Coddington team communicate with Frank in this way. If he is not communicated with in this way, then he is likely to become de-energized and lose interest in what is put before him. As you can see from the graph at left, each style is quite different in terms of communication. This is where ensuring the different communication styles do not become a relationship blockage. Franks wife has a Stabilizer communication style. This is basically opposite to Frank. She would need a much more relaxed meeting and not so bottom-line. The discussion should start with dreams as this is more emotional, whereas goals is more rational. 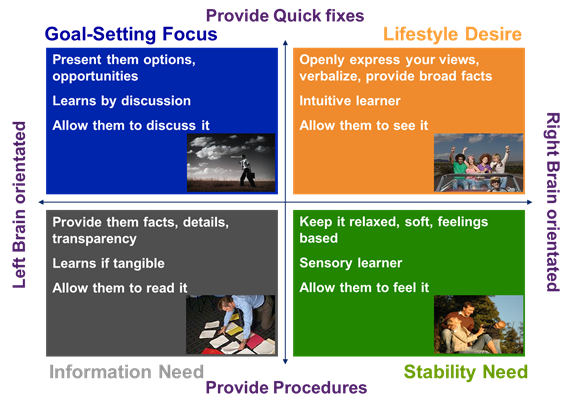 The Lifestyle Desire and Information Need communication styles are also opposite. The Lifestyle person wants a fast-paced, open discussion and fun, while the Information Need person wants to get into the details and reflect. He or she does not like it too conceptual. Of course, here is where the spender and saver difference comes up more acutely. The Information Need person likes to focus on the budget. To the Lifestyle Desire person a budget is a turnoff. The advisor should talk instead about spending plans. From time to time an individuals score may reflect a Lifestyle Desire as the primary communication style; however, the client may have a second style that also scores highly, such as a Stability Need. In any cases like this, the elements of both factors would be important in communication with the client. When Chris is dealing with spouses in the same meeting, he must address each of them on his or her own terms, unless one of them chooses to accept one way. Based on social research it tends to be the female who will make 70% or more of the financial choices. So, if you do not have guidance on know how to run the meeting with a couple, start by addressing the female spouse on her unique terms. Remember, women want to be understood and men want to be respected. So, do not leave the male totally in the cold. When it comes to building meaningful and successful relationships with your family, friends, colleagues and clients, effective communication is foundational. Are You Building Sound Relationships? The quality of your relationship with any person has a direct impact on the quality of decisions that get made. If the communication is poor, people start making decisions around each other because the trust has been diminished. Also, poor decisions can be made because the information has not been heard as intended. How Do You Naturally Communicate? You naturally communicate based on who you are and how you see the world. Of course, how the other person hears the message depends on who they are. So often there is a gap that needs to be bridged between what was said and what was heard. Close the Gap. One of the keys to success in any relationship is closing this gap by communicating with the other person on their terms and not your own. How the message is communicated becomes as important as the message itself. This is not always easy because when we are under pressure or out of our comfort zone, we will tend to revert back to our natural behavior. Knowing your own Communication Style is the first step in working towards effective communication with others. Find out your Communication DNA Style by completing our Communication DNA Profile -Click Here. “Know, Engage and Grow Your Customers” for an annual cost of $10 or less per person. 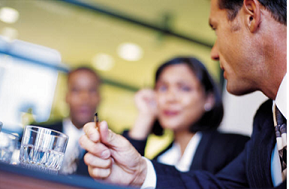 For information on our Enterprise Solutions for improving Relationship Performance – Click Here. Our dream of globalizing DNA Behavior as a leading Human Performance Business has fast come to reality. In the past 12 months, the Communication DNA Profile has been completed in 47 countries worldwide – including Germany, Romania, Russia, Mexico, Singapore, Hong Kong, Brazil, India and China. 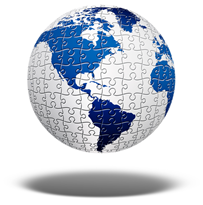 This global reach shows, regardless of possible differences in culture, that businesses, individuals, couples, families and leaders in multiple industries around the world understand the importance of knowing their own Communication style and adapting to the style of others in building sound relationships. How do you wish to be communicated with? How do you customize your approach for different clients? You naturally communicate based on who you are and how you see the world. Of course, how the other person hears the message depends on who they are. So often there is a gap that needs to be bridged between what was said and what was heard. Close the Gap. One of the keys to success in any personal or business relationship is closing this gap by communicating with the other person on their terms and not your own. Our specific Enterprise Solutions help businesses and organizations increase the emotional engagement of employees and clients through tailoring your communication, improving execution and customizing the experiences you create for others each time you interact.